Ex-Jet Keith Tkachuk speaks out about how he understands what Evander Kane is going through in Winnipeg. Dustin Byfuglien is back from the IR after 16 days. Will Burmistrov be back along with Byfuglien? WFP's Ed Tait says they need his spark up front. Craig Knapp of Winnipegjets.org breaks down the five keys to the Jets making the playoffs down the stretch. Since coming back to the NHL, the "new" Winnipeg Jets have been a success off the ice for sure according to WFP's Ed Tait. The ongoing saga of Evander Kane, Twitter, and rumours circulating about the Jets young star continues. 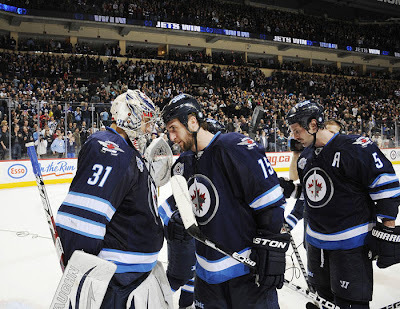 Chris Thorburn has his first as a Jet and will it be the start of something good for the grinding forward in Winnipeg? According to Winnipeg Free Press reporter Gary Lawless, Winnipeg Jets fans love Dustin Byfuglien. Who knew? True North happy with state of AHL affiliate in St. John's. Dustin Byfuglien is still looking after the lingering problems with his summer activities according to the Winnipeg Sun's Paul Friesen. Jets Mission: Make The Playoffs. Jets have plenty to do to make up ground coming out of the All-Star break. Jets are a wild card team going into the trade deadline on Feburary 27th. Illegal Curve Hockey Show's Richard Pollock takes a preliminary look at Evander Kane's market value.